This story should incense every true American, and it showcases the America Leftists built. Further, this story of an 89-year old veteran dying as nurses laugh shows why anybody, repeat ANYBODY who wants to be on Obamacare should know the kind of care they will receive. 11Alive found uncovered hidden camera video catching nursing home staff laughing while an elderly patient dies in front of them. The incident happened at the Northeast Atlanta Health and Rehabilitation in 2014, but the video was recently released as part of a lawsuit filed by the family. That’s right, in order for the truth to get out, the family of WW II veteran James Dempsey had to sue. Attorneys representing the Atlanta nursing home tried to prevent 11Alive from obtaining the video. In fact, they asked a DeKalb County judge to keep the video sealed and then attempted to appeal to the Georgia State Supreme Court. Leftists will do anything to keep the truth from getting out. However, they lost the case. The judge ruled in favor of 11Alive and the nursing home eventually dropped its appeal to the state’s highest court. Now, the video shows what really happened to 89-year-old Dempsey, a decorated World War II veteran from Woodstock. It includes almost six hours of video court deposition of lies. Watch as the former nursing supervisor Wanda Nuckles explains how she responded to the patient before she knew the hidden camera video existed. And as you can hear from the questioning of the victim’s attorney, the nursing supervisor recants, as the video proves she lied through her teeth. In the horrific last moments of his life, Mr. Dempsey calls for help six times before he goes unconscious while gasping for air. According to state records, the nursing home staff found Dempsey unresponsive at 5:28 a.m. This is the type of response to veterans that would make Hillary Clinton proud. Based on the evidence, it took almost an hour for the staff to call 911 at 6:25 a.m. Keep in mind, Mr. Dempsey is IN the hospital. Next, in the video we watch a another nurse respond to Mr. Dempsey’s desperate call for help. She neglects to check any of his vital signs, and merely adjusts Mr. Dempsey. But then Nuckles herself enters the room. One would think the supervisor would have understood the gravity of a man calling for help six times. Yet, Nuckles acts as if she has witnessed a routine situation. 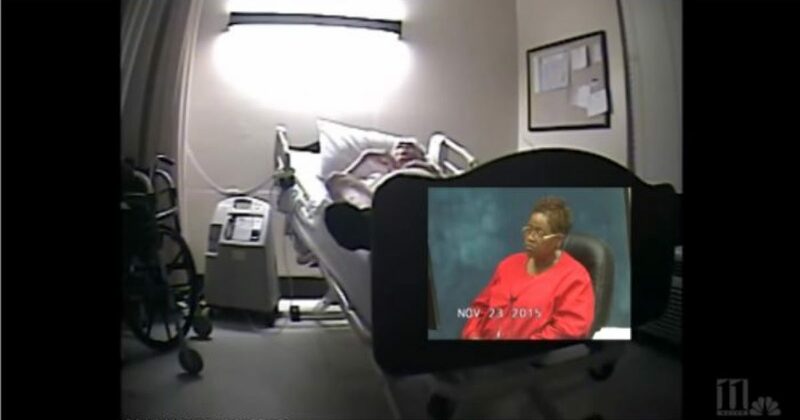 In the video deposition, former nursing supervisor Wanda Nuckles tells the family’s attorney, Mike Prieto, how she rushed to Dempsey’s room when a nurse alerted her he had stopped breathing. The video, however, shows no one doing CPR when Nuckles entered the room. She also did not immediately start doing CPR. While criminals get multi-million settlements for getting themselves killed accusing the police of wrongdoing, nurses actually killed one of America’s protectors. Imagine if this had been 3 white nurses who did this to a black man? How much coverage of this story would America be regaled with by CNN and other fake news Leftist media outlets? One must ask how these nurses would have treated a black patient? Leftist white America should consider the world it has created. Because they or people they love might find themselves in a situation like Mr. Dempsey. Where racists laugh as they or their loved ones gasp for help. We live in a world where decisions are made on politics. What gender is my patient? What color or religion is my patient? We see restaurant workers spit in the food of the police. We see all kinds of discrimination against people due to the divisions caused by the Left. As you viewed the video of a veteran dying, you understand why President Donald Trump was the right man at the right time. We are ONE America. And those nurses should have shown grace and compassion toward that great American who died because they simply didn’t care about him or his service to this country.